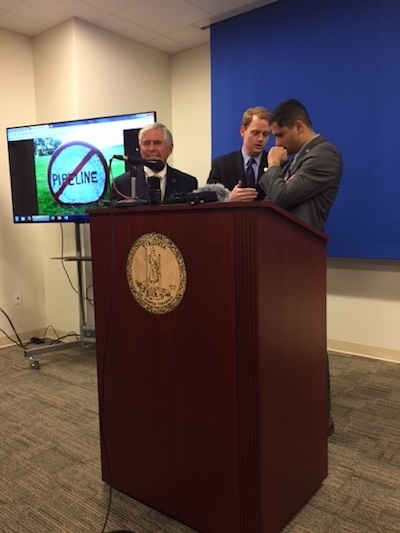 Southwest Virginia’s three Democratic legislators made clear Thursday that their region will continue to resist new natural gas pipelines with a package of bills that calls for tougher state regulations to protect individual property rights and water quality. He noted that in the Southwest there are concerns that construction of a 42-inch pipeline to transport fracked gas through steep mountainous terrain and across streams in the Roanoke and New River Valleys could unearth sediment that could be washed downstream, threatening public water supplies. In October, the Federal Energy Regulatory Commission approved permits for the 300-mile Mountain Valley Pipeline, which would cut through the delegates’ mountainous region, and the Atlantic Coast Pipeline, a 600-mile pipeline that would stretch from West Virginia through parts of Virginia, including miles of national forests and mountainous terrain, before ending in eastern North Carolina. Rasoul said the bill he has introduced, House Bill 1141, would “ensure that the State Water Control Board does its duty, making sure that it doesn’t cede its responsibility to protect our water sources.” It would require both a Virginia water protection permit and an individual water quality certification under section 401 of the federal Clean Water Act. Rasoul and Edwards said during the conference that many of their constituents are upset that the state is relying on a blanket permit by the U. S. Army Corps of Engineers to assess work in areas where the pipelines will cross streams and wetlands. “That’s completely insufficient,” said Edwards. Rasoul’s bill also prohibits any land-disturbing activity, such as cutting down trees, prior to the issuance of a water quality certification. In December, the State Water Control Board voted 5 to 2 to approve permits for the Mountain Valley Pipeline, a project backed by a consortium of companies led by EQT Midstream Partners. Shortly thereafter, a coalition of environmental groups filed suit in the U.S. Court of Appeals for the 4th Circuit, seeking a review of the permits. A few days later, the board also approved permits for the $5 billion Atlantic Coast Pipeline, whose majority partner is Richmond-based Dominion Energy. However, in that case, the board delayed the effective date for the permits — meaning construction cannot begin until additional environmental impact reports are completed. Dominion Energy, which proposed the ACP in 2014, said in a statement following the water board’s vote that “the project has received the most thorough environmental review of any infrastructure project in Virginia history.” The company has argued all along that there was a public need for the project and looked to the recent extreme cold weather of the last two weeks as proof. "Severely limited capacity on the pipelines serving Virginia and North Carolina forced some utilities to curtail service to major industrial customers and raised consumer prices to historic highs. The reason is simple: our region’s pipelines are too constrained, and we don’t have enough access to lower-cost supplies from the Appalachian region," Dominion spokesman Aaron Ruby said in a statement earlier this week. The Southwest legislators did not rehash all the pros and cons of the projects at the conference, concentrating instead on their proposed package of legislation. Hurst’s bill, HB1187, which Edwards will champion on the Senate side in SB324, calls for more protections for property owners along the path of pipelines and restricts the ability of surveyors to access such properties. In addition to notifying property owners before surveying for a natural gas pipeline, such notices would include a time and date of the planned visit, and it would need to be sent at least 21 days before a visit, the bill says. HB1187 also prohibits a natural-gas company from entering property for such purposes “unless the State Corporation Commission has issued to it a public use certification, which may be issued only if the commission finds, among other things, that the company has demonstrated that the pipeline or facility is for a public use." The measure also establishes an expedited procedure for a landowner to seek injunctive relief and authorizes a landowner to bring a civil action for damages, including damages of $500 per day per individual entering or attempting to enter property in violation of the bill’s applicable requirements. In another Hurst bill, HB1188 requires the operator of a natural gas pipeline to file a gas discharge contingency plan that would be approved by the State Water Control Board. The bill gives the board the right to require testing and inspection of the pipeline and annual retesting of groundwater for properties in a pipeline’s right of way. It also provides for enforcement and civil and criminal penalties.